Jean-Pierre Jernander anno 2007 – image courtesy of Guy van Rijn’s Who’s Who in African Art. 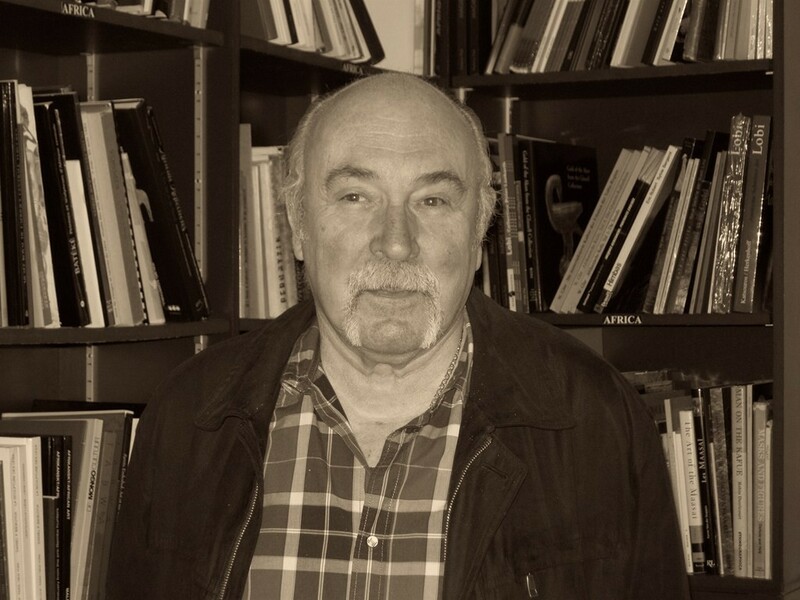 Last week, the former African art dealer Jean-Pierre Jernander passed away at his home in Brussels (above Vasco & Co. books). Born in 1939 in Kikwit, in the Belgian Congo, Jernander spent his youth in Africa. Back in Belgium, his encounter with painter Annie De Vriese played an important part in his life. After their marriage in 1965, she, who loved antiques, encouraged him to become a dealer in African art – which he did in 1970. As Jean-Pierre Jernander’s father had been a State agronomical engineer in the Congo during his whole career, many retired colonial officiers opened their doors (and collections) to him in Belgium – where he discovered numerous masterpieces. 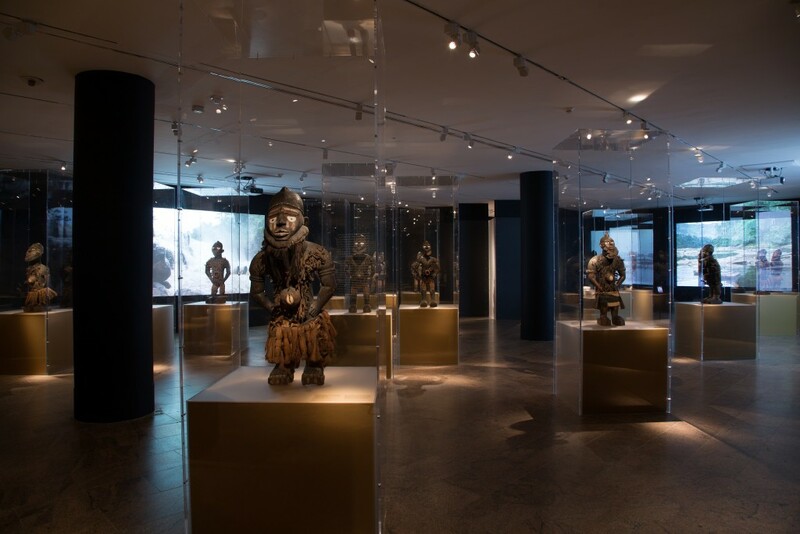 It’s telling that the current Kongo exhibition at the Metropolitan (info) shows two iconic objects that once passed through his hands: the famous Kongo maternity figure from the Master of Kasadi from the National Museum of African art (info) and a crossed-legged Yombe figure from a private collection (info). The Virginia Museum of Fine Arts holds a fantastic kneeling Vili maternity figure, and an important Yombe sceptre, both discovered by Jernander. The Detroit Institue of Arts has a magnificent Mangbetu harp and the Minneapolis Institute of Art a Songye figure – just to make it clear that his finds are now spread over important collections all over the world. One can only imagine the life full of thrills Jernander must have lived discovering all these masterworks in private colonial collections. Several objects of his private collection were published by Cornet in Zaire. Peuples/Art/Culture (Antwerp, 1989). 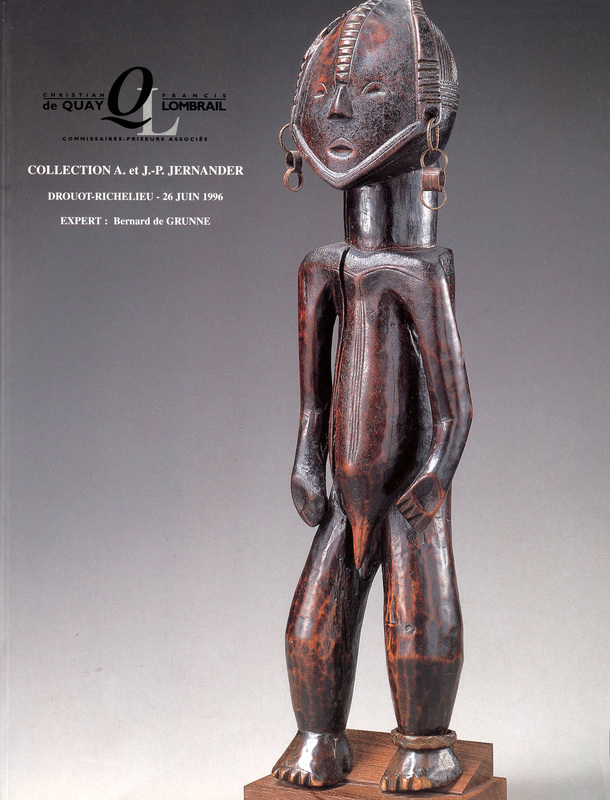 After the untimely death of his wife in 1996, Jernander put up his entire Congolese collection for sale at Drouot in Paris – with the exception of his exquisite collection of Congolese ivories, which unfortunately later was stolen from him. Partly published in Belgium Collects African Art (pp. 252-257), its current whereabouts are unfortunately still unknown. This entry was posted in News on November 24, 2015 by admin. 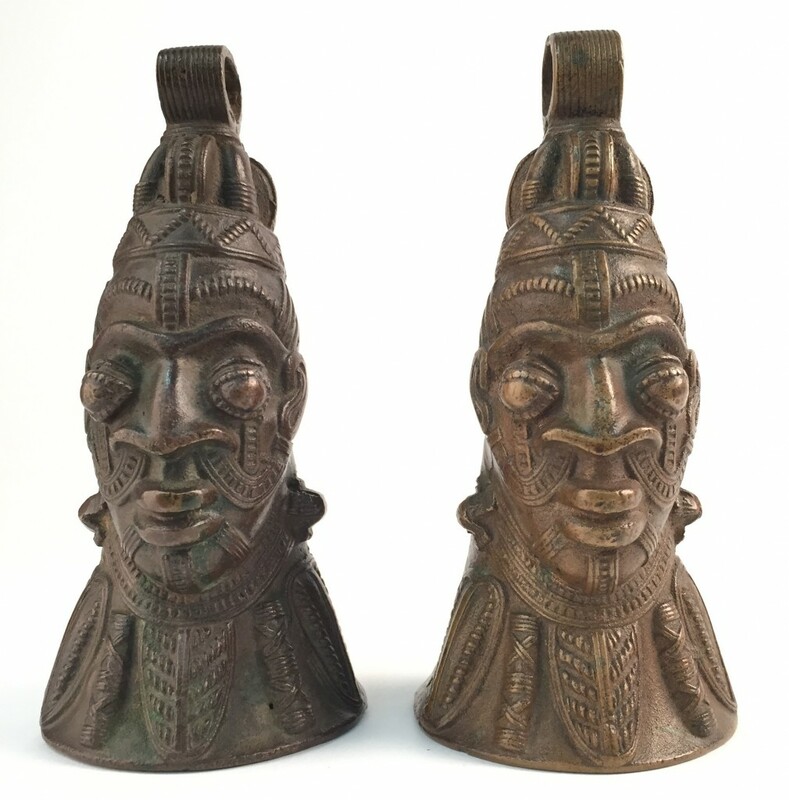 Above two conical bells that depict human heads in a style that is generally identified as the ‘Lower Niger Bronze Industry’ (southern Nigeria). It may come as a surprise, but these were not made in Africa: identical in form and size (but not in alloy), they were cast from a mold in the UK. These bells can be identified by a seam where the two halves have been attached (as opposed to the seamless lost-wax method traditionally used in Nigeria). 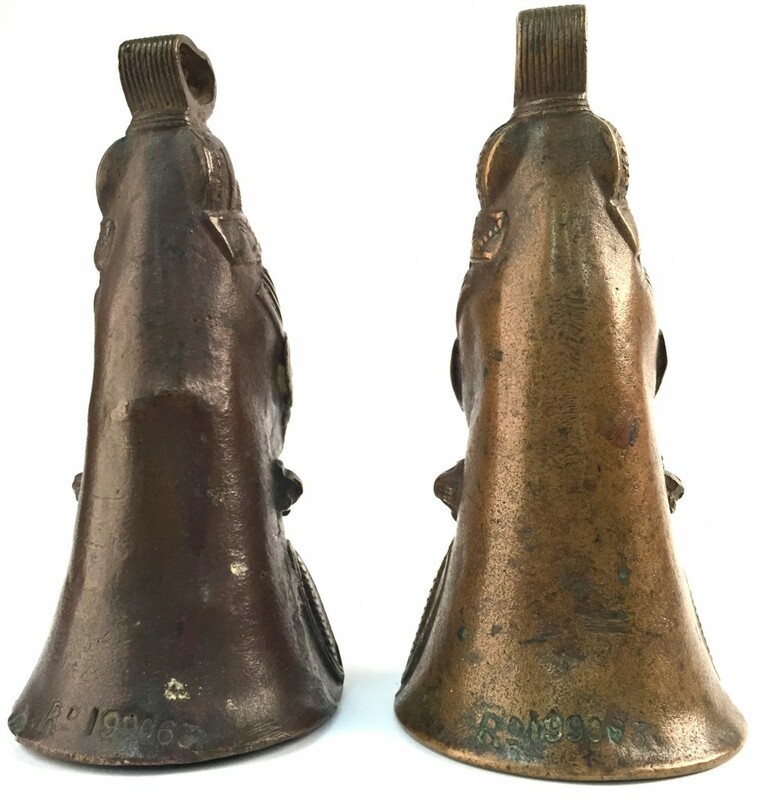 John Picton recalls that he and William Fagg saw ‘bells with a stamped job number on the back’ at the British Museum in the 1970s, and that ‘unlike the regular Lower Niger River bells they were cast in piece molds, as evidenced by the seams along each side from top to bottom. Fagg’s hypothesis was that enterprising English District Officer or trader might have seen such a bell on a Nigerian shrine and taken it to a UK foundry (Birmingham is only a suggestion of where they might have been made) to produce a series, then to test their sales-worthiness in the lower Niger region. Presumably these replicas were made for sale or trade or as gifts in what is now southern Nigeria around 1900. Examples have later been documented in rituals among the Urhobo, Igbo and other groups, so some of them did end up on a shrine – and thus can in way be deemed ‘authentic’. These bells always have a stamped number on the lower back – you can zoom in by clicking on the above picture; it starts with ‘R’, followed by 199063. They weigh more than twice as much as the thinly cast authentic bells; made at a time when copper was still scarce. A couple of dozen of them are known and one of them even ended up in the collection of the Metropolitan (info, correctly listed as ‘made in England’). Christie’s even sold one in 2006 for € 3,360 (info). 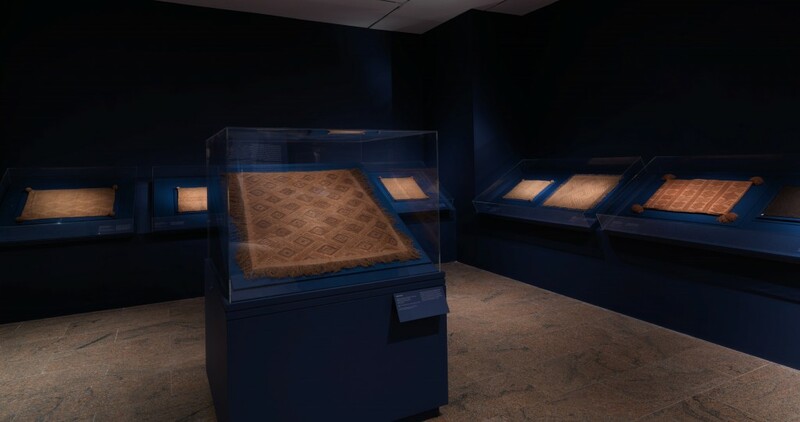 The present whereabouts of the original bell remain a mystery, but the Dallas Museum of Art holds one that is similar in style (info); as does the Smithsonian (here). 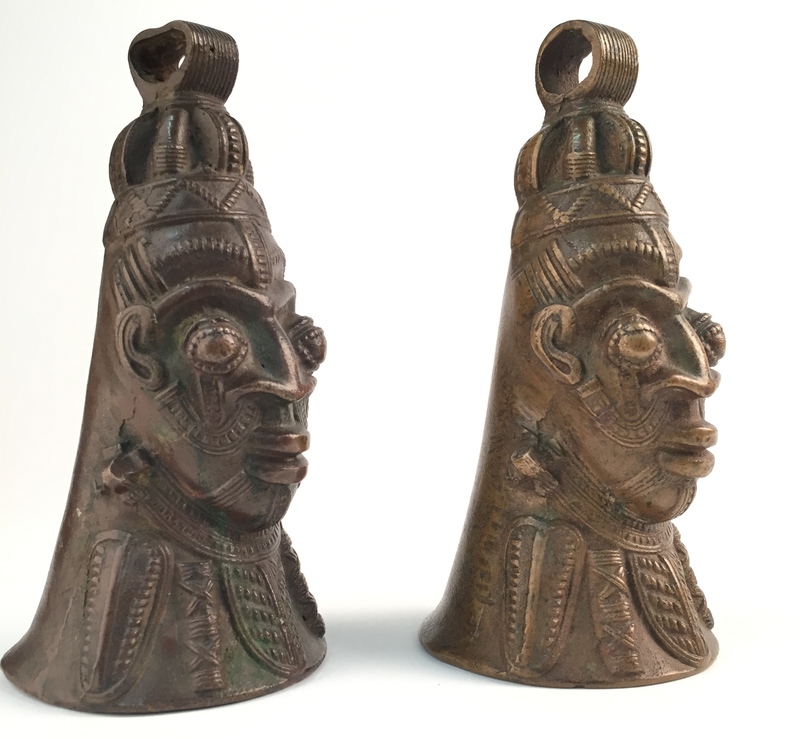 The function of these bells remains unknown, but the imagery of the (abstract) snakes issuing from the nostrils can be associated with the Edo of the Benin Kingdom, the Yoruba, the Igbo and other groups in the region. Don’t hesitate to get in touch if you would have more information about them. This entry was posted in Objects, Research on November 20, 2015 by admin. 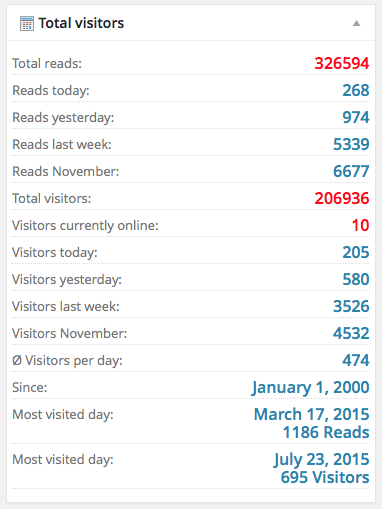 That’s the number of visits this website has had since it was launched in May 2013. It passed the 200,000 mark undetected last month. It’s nice to see how many of you have stuck with the site since the beginning, and also how many new readers continue to take a look. After 2,5 years, this site now has on average over 450 visitors a day. I’m very grateful to you all for your interest and support – thank you. Don’t forget to look back at older blog posts, as they often get updated with additional information and/or comments of readers. Wishing you a wonderful weekend, Bruno. This entry was posted in News on November 13, 2015 by admin. Ladislas Segy and Lloyd Moss. 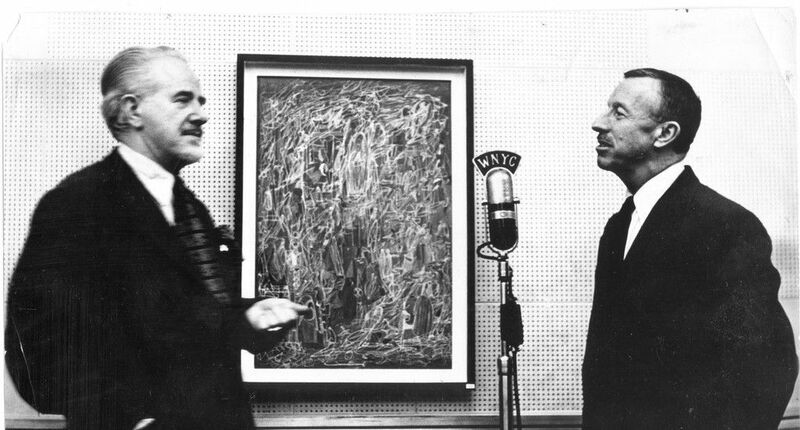 Image courtesy of NYC Municipal Archives WNYC Collection. A reader was so kind to send me a link to a radio interview (anno 1951) with African art dealer Ladislas Segy; hear it here (15 minutes). How wonderful to hear his voice, talking about his gallery, his background, why he got into African art, etc. Sixty-four years later, one can argue about the quality of the objects he sold in his gallery, but a pioneer in the popularization of African art he certainly was. This entry was posted in Research on November 10, 2015 by admin. The traditional centers of the trade in African art are generally considered to be Paris and Brussels. I was curious to see if there’s still a notable predominance of objects coming from the former colonies of both France and Belgium in the coming auctions in Paris. 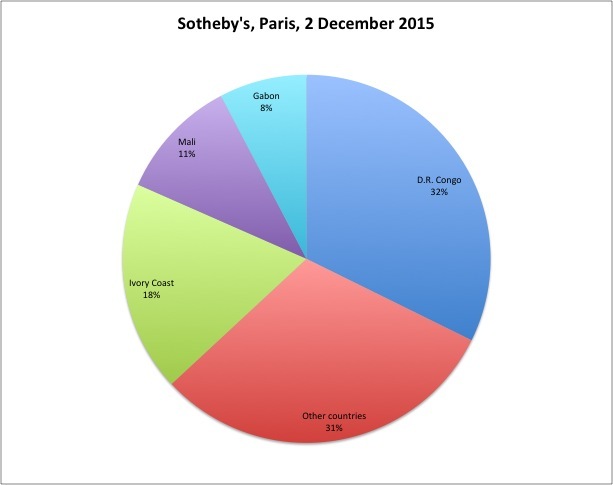 The graph below shows the percentage of lots coming from the ex-colonies in the next Sotheby’s sale. Almost three quarters of the African segment of the sale is made up of objects coming from Mali, Gabon and Ivory Coast (all former French colonies) and D.R. Congo. 21 objects come from D.R. Congo; that’s 32 % of the African part of the sale! The remaining 31% are objects from Nigeria (4), Congo Brazzaville (4), Cameroon (3), Ghana (2), Angola (2); and Guinea, Tanzania, Burkina Faso, Sudan and Madagascar (all 1 object). 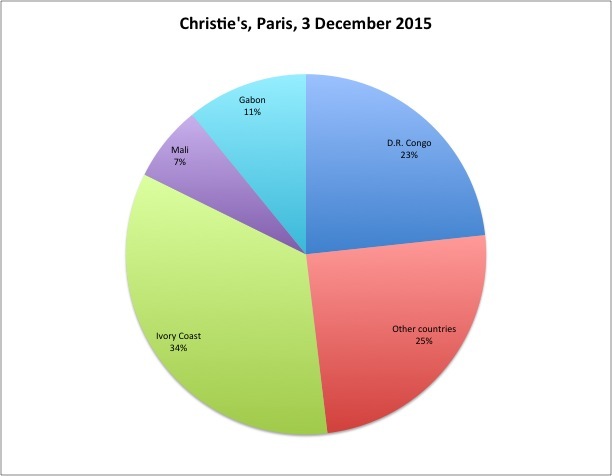 At Christie’s we more or less get a similar image, as only 25 % of the African lots in the sale don’t come from a former French or Belgian colony. 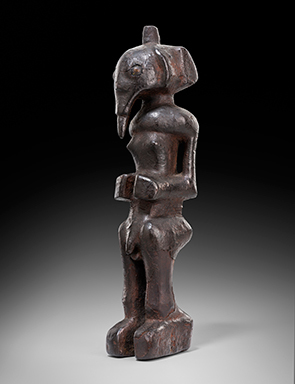 From the 25 objects from Ivory Coast, 14 are Baule – so almost 20 % of the African part of the Christie’s sale is made up of objects coming from one specific group. The remaining objects, from ‘Other countries’, come from Nigeria (4), Cameroon (4), Sierra Leone (3), Burkina Faso (3); and Ghana, Guinea, Tanzania and Togo (all 1 object). Of course, this is just a snapshot based on only two auctions – a much more balanced view would emerge if one would take into account several years of sales. Still, it is for example notable how underrepresented art from both Nigeria and Cameroon remains in these sales.. while art from the Baule and Kongo predominates. Another interesting calculation would be to take into account the estimates as well; in such a case especially Gabonese objects (Fang and Kota) would be most prominent when put in a graph. It’s clear that historical connections with specific African countries play a major role in the degree of presence at auction – especially in France. This entry was posted in Auctions on November 9, 2015 by admin. 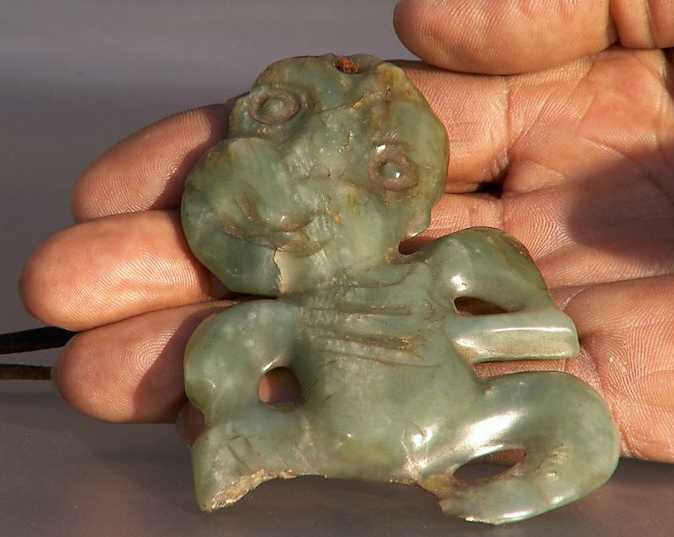 An amazing discovery during the BBC’s Antiques Roadshow: a woman was weeding in her garden and found the above Hei-tiki buried in the ground in a cloth pouch. Check out the video clip here. This entry was posted in Discoveries, News on November 9, 2015 by admin. Nkanu panel, D.R. Congo. Height: 41 cm. Image courtesy of Christie’s. What better way to spend your Friday afternoon than scrolling through the new auction catalogues of the December sales in Paris. Find the catalogue of Sotheby’s (on 2 December) here, and from Christie’s (the next day) here. The African art department of the latter again without Stanislas Gokelaere as a consultant. This entry was posted in Auctions, News and tagged Nkanu on November 6, 2015 by admin. Image courtesy of the Fundação Sindika Dokolo. Fundação Sindika Dokolo has acquired two ancestral female Pwo masks and a rare statue representative of the male figure of the Chokwe people from private European collections. 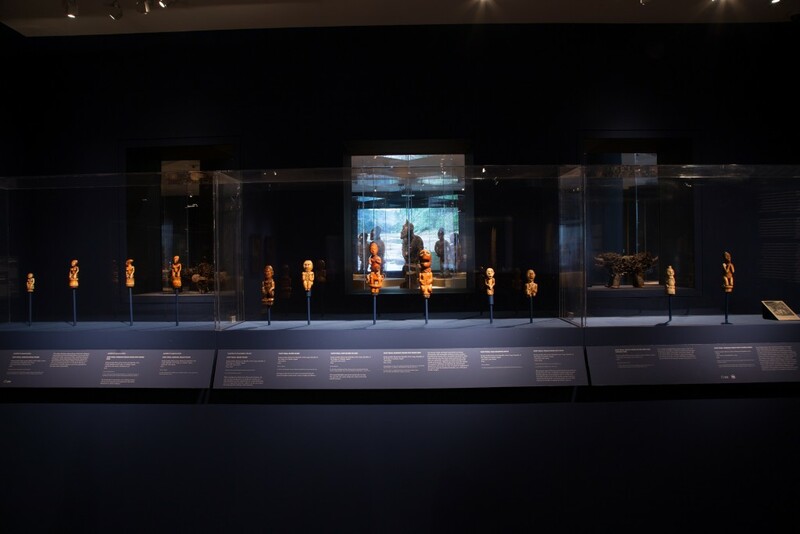 The classical works, which have been identified as looted from Angola during the civil war, will be repatriated to the Dundo Museum in Angola, their original home and where they were last exhibited. These masterpieces, created around the end of the 19th century to the beginning of the 20th century, hold historic and cultural significance for the Chokwe people. The Chokwe people inhabit north eastern Angola, the southern part of Congo (Kinshasa) from the Kwango River to the Lualaba and, since 1920, the north western corner of Zambia. The ‘found’ pieces belonged to the Dundo Museum which held one of the most distinguished collections of ethnographic art from wooden traditional masks and wooden sculptures of the local heterogeneous Chokwe people to recordings of local folk music and a photographic collection dating to the 1880s. Located in a mining town in north-eastern Angola about 15 miles (24 km) south of the Democratic Republic of the Congo border, the museum saw many of its art works ‘disappear’ during the Angolan civil war from 1975–2002 and due to lack of archival documentation, the number of missing works and their whereabouts remain a mystery. The recovered works have been slightly altered from their original state: on both of the Pwo masks, the cord hair has been removed and the surface of the wood has been retouched and altered to hide original carved motifs visible on the surface of the wood; this is thought to be have been done to render the pieces unrecognisable and untraceable. They were sold on to private dealers and acquired by various collectors in the intervening years. 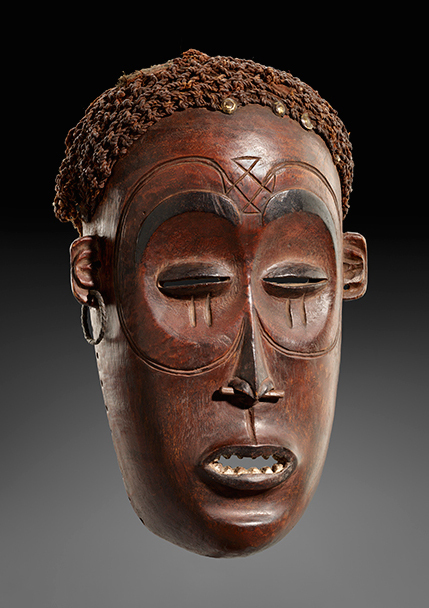 The return of the Pwo masks and sculpture is the result of diligent research by Brussels-based gallerist Didier Claes and Parisian dealer, Tao Kerefoff, both specialists in classical African art. The works were traced thanks to several publications by noted Belgian art historian Marie-Louise Bastin (1918-2000). Her publications remain a principal and definitive source in identifying the different cultures and styles of Chokwe art and its people. 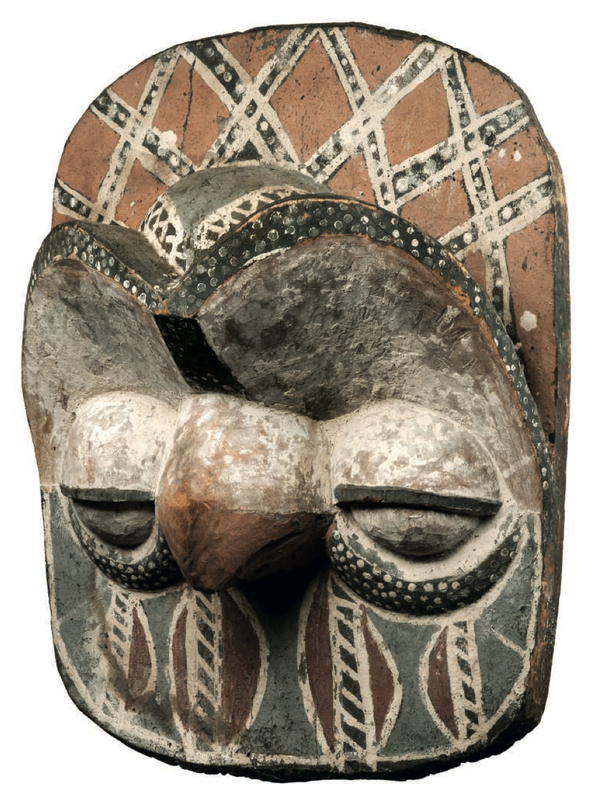 The provenance of both Pwo masks were established through photographs in her book, Art Décoratif Tshokwe: Museu do Dundo (1961). 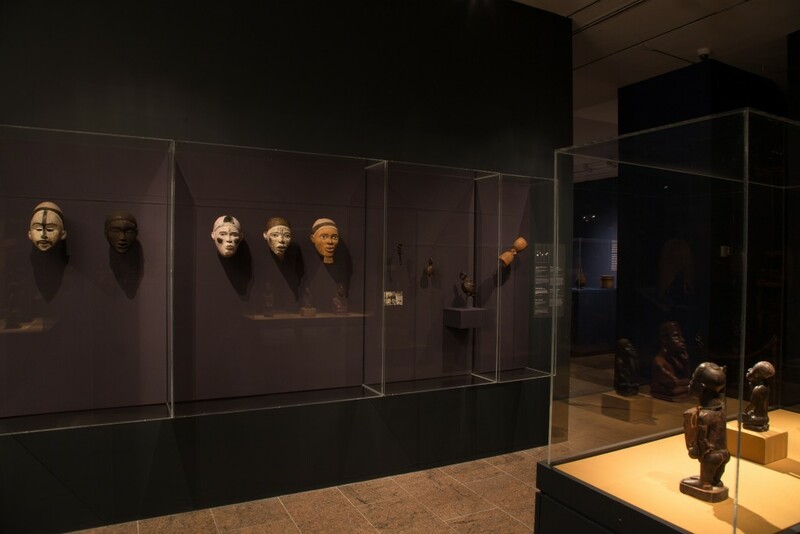 Both masks are illustrated in the book: a photograph taken of an exhibition of “Sala da Crença Animista” or “Animist Belief Room” at the Dundo Museum at the end of the 1950s depicts one of the looted masks in a line-up of 30 Pwo masks belonging to the museum collection. The Chokwe statue is documented in an essay Les Entités Spirituelles des Chokwe (The Spiritual Existence of the Chokwe) written by Bastin and published in the academic paper Quaderni Poro in 1988. 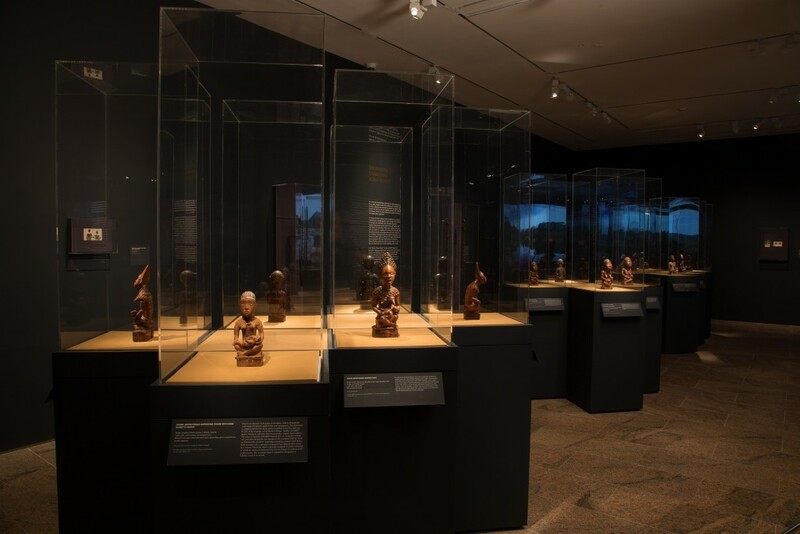 This pioneering project to recover classical works of African art enables Fundação Sindika Dokolo to advance a local and a global dialogue of the epic story of African civilizations. Inspired by his father Augustin Dokolo Sanu, a great collector of classical African art, Sindika Dokolo created his foundation to document the journey of arts and culture from Africa with the aim of empowering future generations of Africans with the knowledge of their own cultural history. Before their return to the Dundo Museum, these important works will travel to Luanda where they will be exhibited at the new Currency museum as part of La Triennale di Luanda at the end of November. The occasion will also celebrate forty years of Angolan Independence. I could only find a picture of one of the masks. The statue, illustrated below, was offered for sale at an auction in Brussels in January 2015 (info). I think the smart thing to do now is to set up a website featuring an inventory of all objects that went missing from the Dundo Museum, so that each new Chokwe object that appears on the market can be checked. This entry was posted in News and tagged Chokwe on November 4, 2015 by admin. Photograph by Peter Zeray, The Metropolitan Museum of Art. For the armchair traveller and those of us who will not have the chance to travel to New York, some professional installation shots from Kongo: Power & Majesty – click on the pictures to zoom. With thanks to the Department of Arts of Africa at the Met for providing the pictures. 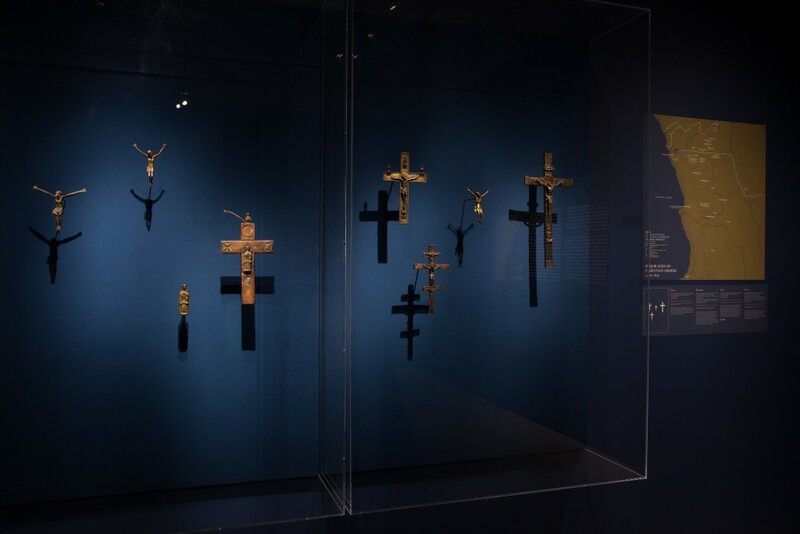 This entry was posted in Exhibtions, Museums and tagged Kongo on November 3, 2015 by admin.